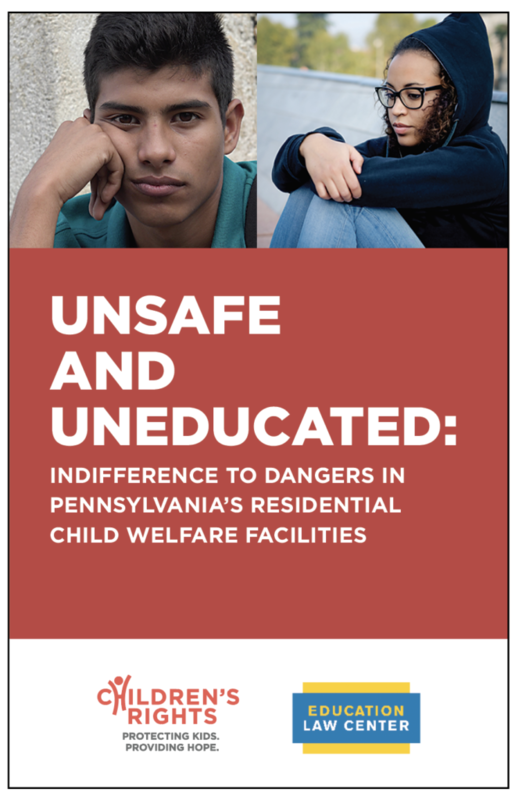 A new report by Children’s Rights and the Education Law Center raises grave concerns about the safety and educational opportunities of youth in residential foster care in Pennsylvania. The number of children living in Pennsylvania group facilities exceeds the national average. Too often, because of a woeful lack of oversight, they suffer verbal, physical, and sexual abuse and mistreatment from staff and other children. Yet the state continues to ignore repeated reports of violence and mistreatment — and uses taxpayer dollars to put children in harm’s way. But the harm doesn’t stop there. Children’s educations are also being largely ignored: most of them attend “on-grounds” schools located at or near the residential facilities, instead of at a nearby public school. These schools often lack even the basics of a decent education, with children of various ages mixed in one classroom and a curriculum that relies heavily on worksheets. Sometimes, students cannot even receive high school credit for their work because the coursework at these schools is not recognized. The report was released in December, and early response from the media and advocates has been one of outrage. Pennsylvania’s children deserve what every child deserves: safety and security at home, and educational opportunities at school. Pennsylvania owes them no less.